Early strength plaster with improving additives, that is easy to use. 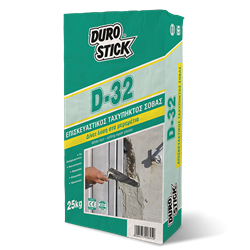 It provides strong adhesion and durability to all wall surface repairs. Apply it in thicknesses of up to 1cm per coat, on surfaces made of brick, concrete, aircrete that were previously soaked thoroughly. Absolutely necessary for painters performing repairs and patchwork due to electric, plumbing or aluminum frame installations. It has the same grain size with top coat plasters, thus making it the ideal solution for repairs (patches), as it does not stand out and does not shrink. Classified GP: CS II/W0 per ΕΝ 998-1.